Launchpad couldn't import bug #194825 from Linux Kernel Bug Tracker. Gigabyte AM4 boards users cannot boot Ubuntu successfully. Commit linux-gpio/fixes babdc22b0ccf4ef5a3075ce6e4afc26b7a279faf "pinctrl/amd: Use regular interrupt instead of chained" can fix the issue. All Gigabyte AM4 boards can reproduce the issue. With the patch, the issue is resolved, per comment #170. Regression Potential is low. It limits to rather new AMD platform which has pinctrl-amd. As the commit log says, use chained interrupt is not a good idea. Use regular interrupt is the correct way. I also test the patch on an AMD laptop, where its touchpad depends on pinctrl-amd. No regression found. and it has a load of problems, starting with not being able to boot normally. system doesn't boot normally, hangs with a lot of "unexpected irq trap at vector 07"
That helps, allowing me to boot into recovery mode, though it leaves me with system seeing only one core, is really slow and still only boots in recovery mode. 2. Compile own kernel using 4.11.rc1 and disabling cpu freq governor and cpu handling in acpi settings. Boot with "quiet loglevel=3" option. but its enough to get info for this bug report. I've tried to redirect dmesg to a file, stopped after a short while, it generated 400M of those. 2. Systemd cannot start journald. Perhaps because it cannot cope with amount of kernel logs? 3. Looking at pci, I've noticed something called AMDI0040 (/sys/bus/acpi/devices/AMDI0040, path=_SB_.EMMC), among AMDI0010, AMDI0020, AMDI0030. Those however are mentioned in kernel source, kernel and google are completely silent about AMDI0040. so I suspect it is an issue with motherboard. Would it be possible for you to test the latest upstream kernel? Refer to https://wiki.ubuntu.com/KernelMainlineBuilds . Please test the latest v4.11 kernel. The issue had nothing to do with upgrades, its the same problem on 16.10 as well as on 17.04. I've tested it on my system and on live ubuntu on usb. I've tried to use mainline kernel and the problem is still there. but I've turned of everything to make sure nothing is using gpio. Perhaps only one of them could be really necessary, but I didn't tested that. System boots normally, no problems with journald and no weird messages from dmesg. Maciej, do you have any suggestions if there is no previous OS installed? Any way for to fix the installation image so that I can at least get a base installation going? Guys, I've updated the firmware of my GA-X370-gaming-5 to F4 and with kernel 4.10.1 and acpi=off it's almost working. My last issue is that only one core is available. I've tested with Fedora 25 (4.8 kernel with backports) and everything is working perfectly : all cores are available so it may due to kernel configuration, but I did not find where the issue is. > Maciej, do you have any suggestions if there is no previous OS installed? (just acpi=off might be enough). That should get you through installation. Setting acpi=off gets me into login screen but fails to authenticate me .. so, I`m stuck there. This occured when I tried to upgrade from 16.04 to 16.10 ... then I tried installing the 17.04 with same problems ... instal was hitting the IRQ vector 07 problem. If you guys need any other info, please let me know and I can collect some more. I can confirm that for Ryzen X1700 and same Mainboard as mentioned by Cosmin. 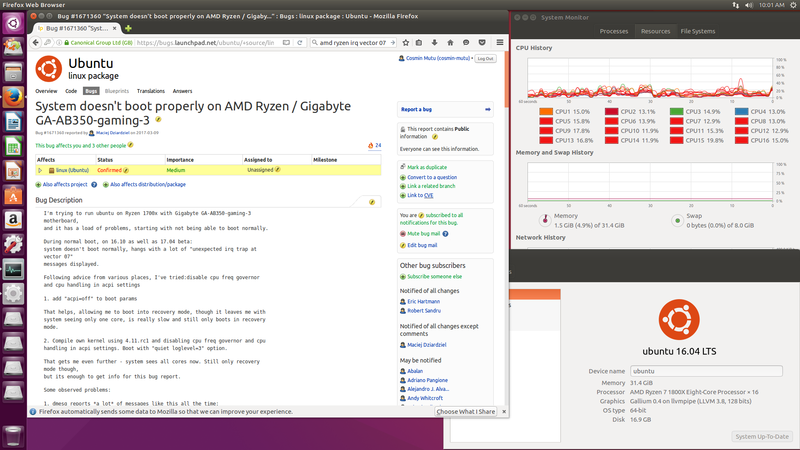 Ubuntu Studio 16.04 is working without any problems, Live version of 16.10 messes up with thousands of IRQ traps. Still gets stuck during startup. Removing the acpi=off parameter spews again the irq trap messages so same situation. For all it's worth I'm also using an NVMe bootdrive - not sure it makes a difference. Giving up until a kernel dev with the appropriate knowledge looks into this. Installed 16.04 - runs just fine (just like Heiko mentioned above). All 16 cpu`s are visible, however, no way to get temp information (sensors can`t find anything). Cosmin, when you say you installed 16.04, do you mean Ubuntu Studio 16.04 or the standard distribution? Did you install the OS from scratch using an USB stick of some other media? You were trying to do an update to 17.04 so did 16.04 boot initially correctly? Please provide details, just saying it works isn't helping to pinpoint the issue. As Maciej Dziardziel suggest, I've rebuild 4.10.1 kernel and deactivated GPIO_AMDPT, GPIO_AMD8111 and PINCTRL_AMD. The system was booting correctly, however I cannot use any USB keyboard. So I've rebuild the kernel, deactivating only PINCTRL_AMD and everything is working fine now. Here is my setup : Aorus GA-X370-Gaming-5 with Ryzen 1800X. However lm-sensor is not working properly. I wonder what the differences between motherboards are. I suspect Gigabyte has something other boards don't have. @Robert ... sure, let me clarify the events. 1. I had Ubuntu 16.04 LTS for some time already running on my system. So, Huang, can you make 2 DVD`s .. one with 16.10 and another with 17.04 (or 2 bootable flashes) and just "TRY" both of them, without installing ... I wonder if that works for you. Hi Cosmin, thanks a lot for the details. So my next tentative will be to take the drive out from that computer, install in a different one and perform the 16.04 install and move it back to the Ryzen system. That would be similar to your initial state with a working 16.04. One last question (:-), was your existing 16.04 running on a special kernel version before you moved your SSD to your new Ryzen system? @Eric: I've managed to boot the system using your custom built kernel! So clearly the code around PINCTRL_AMD seems to be related. I had exactly the same situation of post #23. Coming from Kubuntu 16.04, bought a new system Ryzen 1800x+GA-AB350 Gaming 3. First boot, using the "old" SSD worked fine, so I decided to upgrade to version 16.10. The procedure goes well, but after the reboot got plenty of error message "IRQ VECTOR 07". So I tried with a USB stick and Kubuntu live version 17.04 both beta 1 and Nightly but got the same error. The only way to make the system working, is to manually select kernel 4.4.0-64-generic from grub. I've also tried to install ubuntu kernel 4.10 and 4.11rc1, but I always get the same error. @Robert, on Ubuntu 16.10 you can install the nvidia-378 drivers that contains the fix for the kernel 4.10 (I'm using it). @Marciej here are the results for GA-X370-Gaming-5 board (with 1800X processor). Please note that it's the result on 4.10.1 with PINCTRL_AMD removed. At least that`s how it worked for me. 2. Select "About this computer"
3. On opened pop-up in the bottom right corner there should be a button which either says "Update" or "System Up-To-Date"
Let me know if the 16.04.01 install worked ... hope it does! I created a usb with 16.04.1 and it starts without problems. When i tried to install it asked if I wanted UEFI or bios mode, UEFI failed to install but bios worked. Disable the CPU based USB ports - That's all of the version 3.0 ones. Probably most of the rear and front ports. Only use the 3.1 or 2.0 USB ports associated with the B350 southbridge. Looked around in bios but found no way to disable the CPU USBs. Tried to boot with nothing connected to them but it failed with same error messages as before. I have this issue with a Ryzen 1800X and a Gigabyte GA-AB350 Gaming (not 3) mainboard. I can boot the live desktop from USB if I pass acpi=off, but /proc/cpuinfo lists only one core. I have exactly the same problem with a Gigabyte AB350-Gaming 3 motherboard and a Ryzen 1800+. - Ubuntu variations (Ubuntu, Neon, Kubuntu, Budgie) and openSUSE do not work out of the box. They stall with a bunch of 'irq trap at vector 07' messages. - For all of these, after adding acpi=off to the kernel parameters, it runs/installs, but runs on only one core. The system locks up when you try to shutdown. - I tried other acpi parameters but nothing seems to make a difference. Only acpi=off has an effect. - Fedora and KaOSx run and install with no obvious problem. then results in a crash (obviously) and output along the lines of what you can see in the attached files. Case A seems to be more common than B. In case B, the system can still be used for a few seconds before becoming unresponsive. I remember someone mentioned there's no such issue on 4.4 kernel? Anyway, you can use Zesty's kernel in Xenial. Install package "linux-generic-hwe-16.04-edge" will do. everything is working, even the overclock. > state, especially not for an Ubuntu Linux system. > Ubuntu related. Unless Ubuntu does something strange on shutdown? I noticed a new beta BIOS ( version F5c) has appeared for AB350m G3, has anyone tried it yet? Does it now properly boot from a live Ubuntu image? I just got a new power supply, I think I will also try the new BIOS on the coming weekend. When should we expect the update with the fix to be available in Xenial? I have linux-generic-hwe-16.04-edge installed, but haven't seen any improvement. According to , it will be released to -updates at 26-June. It will be at -proposed before that. buzuk56's solution worked for me. I'm using Ryzen 5 1500X with Gigabyte GA-AB350-gaming-3. Thanks! 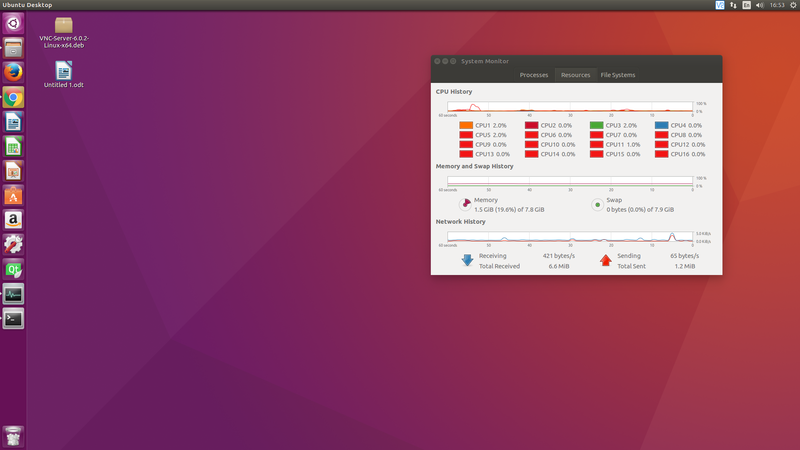 So glad to have Ubuntu on this machine. Will your update be available on June26 on http://releases.ubuntu.com/17.04/ ? Those seems to be stuck on date when zesty was released. Do they files get updated as bugs get fixed? Unfortunately no. I don't think image for Zesty will get any updates. If you want to do a fresh install, you need to use parameters like "apci=off" to install. You can remove "acpi=off" after upgrading the system. Must verification/testing be done in Zesty? I have Xenial on my machine. You can verify the bug on Xenial by installing linux-generic-hwe-16.04-edge=4.10.0.23.16 which is currently on -proposed pocket. This kernel also have the fix for this bug. It works flawless. Is this the proposed kernel to test? Any if yes, where do I have to add the needed 'verification-done-zesty' tag? Yes, kernel 4.10.0-23 is the one in -proposed for Zesty. So thank you for verifying it! The tags are located just below the bug description. I will update it myself. Hi I have installed the kernel, I'm running it on Xenial now and it works good. No IRQ07 issues what so ever. Thanks everyone involved! Does the recent security related release (4.10.0-24) also include this fix, or should I skip it and get 4.10.0-25 from -proposed? I'm using: 4.10.0-24-generic and only able to use Ubuntu with acp=off nickleplated. I'm unclear about how to fetch the versions that people are mentioning in the last few posts. Can someone clue me in on how to fetch `linux-generic-hwe-16.04-edge=4.10.0.23.16.10.0` or `4.10.0-25 from -proposed` with aptitude? Google is failing me. I'd be very happy to test them out and see if it solves the gigabyte motherboard issue. John, I used the link mentioned above (https://wiki.ubuntu.com/Testing/EnableProposed), but replaced xenial with zesty. In aptitude, I looked through all the upgradable packages and only selected the ones with the new kernal version number. My machine uses the Gigabyte X370 Gaming 5 with the 1800X. No OS on the SSD. IRQ 07 errors and the system hangs without entering the installer. I've tried the above grub parameters acpi=off with no luck. What are the steps needed to boot into a live usb and get ubuntu installed to then enter -proposed and get the upgraded kernel packages for full usage? nickleplated, Thanks you I missed the link somehow. 4.10.0.-25 from proposed solved the issue for me with the Gigabyte AB350 Gaming 3 with bios 7. Try the "pending" one instead of "current". I've just tested pending 17.10 and have the same results. Are there any specific BIOS options required? My system is currently using IOMMU for my 16GB ECC RAM. This is the only option I have changed in the BIOS. Arch can successfully boot on the machine. If you need anything testing, I can try it on my machine if needed, will use another SSD for Windows. Have others installed F6 when testing? What's the version of Arch's kernel? What's the kernel version of 17.10 live USB? Linux version 4.10.0-25 has the fix but 4.10.0-24 does not. Kernel version for the image I'm using is: 4.10.0-22-generic. Should I download again as I see it was modified today, where as I downloaded it on the 26th. Will this fix be implemented in the downloadable daily images? I have downloaded the most recently modified (29/06/2017) and kernel 4.10.0-22 is still in use. When Artful (17.10) switch to 4.11, the daily image will also get new kernel. Artful should switch to linux kernel 4.11 pretty soon. Ok, Artful live image (the pending one) uses 4.10.0-26.30 now. If you still can't boot, then it should be another issue. I encountered a similar or same problem on Gigabyte AB350 with Ubuntu 16.04 running `4.13.0-21-generic #24~16.04.1-Ubuntu SMP Mon Dec 18 19:39:31 UTC 2017`. It even shows up on 18.04 Alpha. Only thing that makes it halfway work is setting `acpi=off`. Isn't this supposed to be fixed by now? > I encountered a similar or same problem on Gigabyte AB350 with Ubuntu 16.04 running `4.13.0-21-generic #24~16.04.1-Ubuntu SMP Mon Dec 18 19:39:31 UTC 2017`. It even shows up on 18.04 Alpha. > Only thing that makes it halfway work is setting `acpi=off`. > Isn't this supposed to be fixed by now? Please file a new bug with log attached. > which is subscribed to the bug report. > Gigabyte AM4 boards users cannot boot Ubuntu successfully. > Commit linux-gpio/fixes babdc22b0ccf4ef5a3075ce6e4afc26b7a279faf "pinctrl/amd: Use regular interrupt instead of chained" can fix the issue. > All Gigabyte AM4 boards can reproduce the issue. > With the patch, the issue is resolved, per comment #170. > Regression Potential is low. It limits to rather new AMD platform which has pinctrl-amd. > As the commit log says, use chained interrupt is not a good idea. Use regular interrupt is the correct way. > pinctrl-amd. No regression found. > and it has a load of problems, starting with not being able to boot normally. > system doesn't boot normally, hangs with a lot of "unexpected irq trap at vector 07"
> boots in recovery mode. > and cpu handling in acpi settings. Boot with "quiet loglevel=3"
> but its enough to get info for this bug report. Displaying first 40 and last 40 comments. View all 216 comments or add a comment.